Have your kids settled in at school, nursery and preschool? Are you looking to win them a treat? Mummy To The Max have teamed up with Squeaky Jumpers to offer a fun, fabulous Spot the Pig Print jumper. Squeaky Jumpers is a funky, novelty clothing company based in the heart of the UK, among the rolling countryside! Launched in 2012, Squeaky Jumpers have combined easy-to-wear classic crew neck sweatshirts, printed with fun countryside inspired prints. Squeaky Jumpers are passionate about supporting British industry, which is why they can very proudly say all of their products are made in the UK. From concept to production Squeaky Jumpers sweatshirts are truly British, and made using high quality materials and craftsmanship. 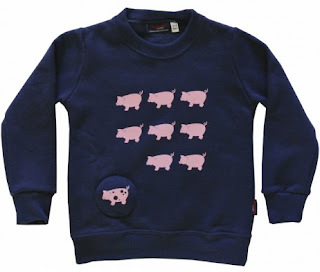 Hello, my name’s Spot the pig, and myself and my playful friends are printed on the front of these Squeaky Jumpers. I love…..making cakes with my mummy, playing in the mud and running around with my friends (I’m always the fastest!!). Take me home and I’ll treat you to lots of lovely warm cuddles. Navy blue children’s sweatshirt, very proudly made in Britain, with hand-printed design. Built in squeaker, just squash for lots of funny squeaky sounds. Unisex design and sizing. To be in with the chance of winning a Spot the Pig Sweatshirt which is available in sizes 2 years - 12 years, all you simply need to do is enter the rafflecopter below. How cute is that jumper? I love it... fingers are crossed! Great looking jumper. We need to go shipping and get some winter clothing for the little one. N would love this seeing we've got a few piglets on the farm. Although think I'd go mad with the noise! Ha ha ... Good luck. Ha ha .. Good luck Lisa.